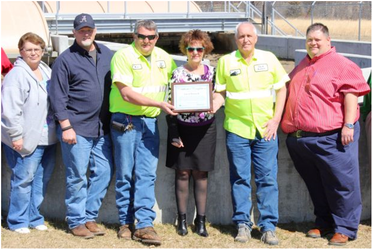 BISMARCK – USDA Rural Development State Director Janie Dunning offered her congratulations to the city of Bismarck on Thursday for the recent completion of its wastewater system improvement project. Prior to the new wastewater treatment plant, the city had settling issues with its treatment plant which resulted in decreased efficiency. Infrastructure improvements were also made to sewer mains, manholes and lift stations. USDA Rural Development funds totaling $2,500,000 in the form of a loan and a $2,965,923.92 grant were used for the project. Funds from USDA were supplemented by funding through the Missouri Department of Economic Development’s Community Development Block Grant Program made possible through the U.S. Department of Housing and Urban Development. Water and Waste Water Grant and Loan Programs funds are made available to assist in the development of water and waste disposal systems in rural areas and towns with populations no greater than 10,000. The funds are available to public bodies, non-profit corporations and Indian tribes. She also noted that the city had made a right choice in starting the process of seeking funds early. Participating in Thursday’s event were Bismarck aldermen Carol Baker, Aaron Radford and Charles Radford; alderman candidate Jeremy T. Shy; mayoral candidate Seth Radford; Bismarck Administrative Assistant Williams; Plant Operator Mark Craig; city employee Roger Radford; St. Francois County Presiding Commissioner Dr. David Cramp; Second District Commissioner Patrick Mullins; First District Commissioner Gary Wilkinson; Contractor Tony Herzog; Taylor Engineering Engineer Tim Robbs; Vandevanter Engineering’s Joe Beffa; CDBG Grant Administrator DED Margaret Yates; senators Claire McCaskill/Roy Blunt representative Christy Mercer; Rep. Jason Smith’s representative Cassie Thomas; USDA Rural Development Area Director Phyllis Minner; State Director Dunning; USDA Rural Development Specialist Donna Martin; Area Technician Belinda Worthy; Multi-Housing Specialist Rachelle Long; and Program Support Director Greg Batson. Tim Robbs, P.E., senior project manager with Taylor Engineering, L.L.C., tells Iron Mountain Lake council members the city’s sewer operation faces two critical issues — the treatment of E.Coli bacteria in the system and lowering the high ammonia content found in the lagoon. IRON MOUNTAIN LAKE — An architectural engineer with a Farmington engineering firm appeared before the Iron Mountain Lake City Council Friday to report his findings on the city’s sewer plant and offered several options the city can take to bring the plant up to EPA standards. Tim Robbs, P.E., senior project manager with Taylor Engineering, L.L.C., told council members the city’s sewer operation faces two critical issues — the treatment of E.Coli bacteria in the system and lowering the high ammonia content found in the lagoon. Robbs said DNR mandates ways to treat the presence of E.Coli bacteria. Robbs said the bigger problem faced by the city is the high ammonia content found in the lagoon. He explained that DNR regulations allow for a presence of ammonia between 4.6 and 4.7 ppm, but that current readings for the system range anywhere from 20 to 30 ppm. To finance the changes and improvements required by DNR, the city will have to either acquire a loan or grant or have the city approve a bond issue, which would allow for much lower interest rates than a loan. In 2010 the city had entered an agreement with DNR to follow a schedule in having the city’s sewer system reviewed by a licensed engineer and, after finding any shortcomings, begin the process of making improvements to meet DNR requirements. At Friday’s meeting, council members said they had been unaware of the agreement until recently and are now approximately two years behind schedule. Although the city has not kept up with the agreed upon deadlines, Robbs said that DNR would work with the city if they saw that the city was taking the necessary steps to meet its requirements. 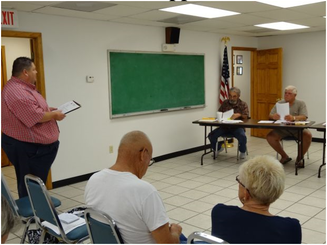 The Leadwood Board of Aldermen met in regular session Monday at the Leadwood Fire Department. The board heard an update on a grant the city applied for in March regarding the water system. Tim Robbs of Taylor Engineering, LLC in Farmington informed the board the city received the grant from the Missouri Department of Natural Resources for an engineering report of the city’s public water system. The grant amount awarded is $30,000. “It’s an 80/20 grant. The state will pick up 80 percent, the city picks up the remaining 20,” said Robbs. The amount the city will owe will be around $6,000. “We’ll look at wells, treatment, water storage. We’ll even possibly look at what kind of capacity you could have with expansion,” Robbs told them. The grant does not apply to the wastewater system. It will deal with potable water lines, pressure issues and metering. A motion was made to approve the detailed work plan, and the vote was unanimous. In other business, the board heard concerns from a former alderman about drop-offs at the intersection of 10th and West streets. Randy Bequette lives at that corner and told the board he’s seen several vehicles drop off into the ditch when making a right hand turn off 10th Street onto West Street. “I’ve seen a firetruck fall off in it,” he told the board. He added at one time he had to give assistance to an elderly driver whose vehicle landed in the ditch. Mayor Dennis Parks told Bequette he was aware of the situation and knows the emergency departments would like to have it fixed as well. Bequette also mentioned the exposed pipe on a gravel portion of 10th Street that has become exposed due to erosion. 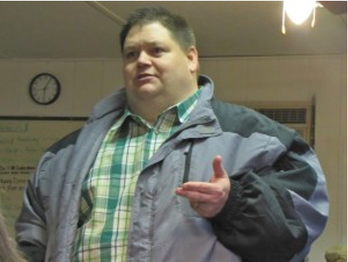 Ward II Alderman Bill Resinger, who also serves as chairman of the streets department, told Bequette he would contact the street employees on Tuesday. “We’ll try to get it as fast as possible,” said Resinger. A groundbreaking was held for the Madison County Public Water Supply North System Water Improvements project last week. The Madison County Public Water Supply District number one is currently working on several upgrades to the system. The project, referred to as the North System Water Improvements Project, is a $3.5 million project, financed by a grant of $875,000 from USDA Rural Development, a $500,000 Community Development Block Grant and $2,125,000 in bonds financed by USDA Rural Development. The project consists of updating and installing 33,000 feet of water line. This will connect the two water systems together, allowing water to be sent from one system to another as needed. It will also increase the line size in some areas to boost water pressure. A new 100,000 gallon elevated water storage tank is currently under construction on Route OO near the airport. This will boost water pressure in some areas of the North System and provide more storage capacity. Other parts of the project include the rehabilitation of an existing 41,000 gallon water storage tank and the purchase of an automatic radio meter reading system and new meters for each customer on both systems. The project will also update approximately 200 of the oldest meter service appurtenances to current specifications and provide those sets with backflow prevention and the refinancing of existing bonds to a lower interest rate. 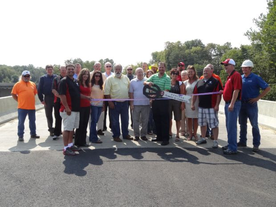 County Commissioner Patrick Mullins officially cut the ribbon Wednesday on the Vo-Tech Road bridge. Construction of the bridge was a joint effort between the county, city of Desloge and state of Missouri. Holding the ribbon is Desloge Mayor David Kater, shown on left, and Desloge City Administrator Greg Camp, on right. Presiding Commissioner Dr. David Cramp, center, and Commissioner Gay Wilkinson, middle with yellow shirt, were also in attendance along with State Representatives Linda Black and Kevin Engler, representatives from general contractor Pace Construction and Taylor Engineer and Horner and Shifrin engineering firms. Mullins explained the bridge came in under budget. MoDOT contributed $400,000 for the project, the city of Desloge contributed $119,000. The remaining funds were obtained from the Off-System Bridge Replacement and Rehabilitation funds. This program provides funding to counties for replacement or rehabilitation of deficient bridges. Mullins expressed his appreciation to Rep. Black and Rep. Engler for their assistance. The final project cost was $1,156,000, well under what was originally estimated. In fairy tales, there's never any real doubt that the hero will get the gold and the girl. Real life, unfortunately, offers no such certainty, but dreams nevertheless still do come true. Such is the case for Frank Taylor, a well-known engineer in Farmington who will be retiring after 25 years in business here and 40 some-odd years total in the engineering field. In Farmington, Taylor started out working for Marvin Hudwalker. A recession sent him away to Texas for a while, but he eventually returned to Hudwalker's firm and worked there a couple more years. Then he decided he wanted to try his own business. That is, after all, the American dream. To own your own successful business and chart your own course in life. Taylor's fledgling office was in the bottom of the building Kevin Engler now occupies. Those first years were exceedingly lean, and Taylor began to wonder if he'd made a big mistake going out on his own. "It's a huge challenge to start a business like that," Taylor said. "People are used to using their own engineering companies that they've used for years. A young guy coming in, it's hard to break in." Taylor's first jobs were not glamorous at all. But they kept the doors open. "I did a percolation test for some people in Desloge and they asked me if I knew anyone who could install it for them," Taylor recalls. It wasn't exactly the type of engineering work he was hoping for, but it was something he could do. "I said ‘Sure, me,’" Taylor said. “‘I can do it for you.’ It's not glamorous, but you can't have much respect for someone who gives up and doesn't try everything they can. So that's what I did, and I made it because of that." And so it was that Taylor was more than just a bit hungry when a seemingly unlikely prospect came along looking for an engineer for what was a very ambitious — and some believed undoable — project. Chip Peterson wanted to move back to the area and raise a family, so he was trying to bring in a JC Penney. To do it, however, he was going to have to virtually transform the entire front entrance to town. Peterson and his partner Joe Burgess had already been to see Taylor's former employer about the job. Marvin didn't take the job. He sent them instead to Taylor. "I don't think Marvin took them very seriously," Taylor said. There were after all, Taylor admitted, an awful lot of hoops they'd have to jump through to make the project fly. And there were a lot of agreements behind the scenes that Peterson had to put together as well. Even one of which could have killed the whole deal if an agreement couldn’t be reached. The job in short a huge step for all three men at the time, and it was a make or break career move. "We were all much younger then, and not used to getting involved in things," Taylor recalled. Still, getting a job like that, Taylor felt like he was in “tall cotton.” Finally a job besides septic tanks! "It turned out to be a real life saver," Taylor added, "and it worked out good for all three of us." The job itself was quite a boost to his reputation, but it wasn't an instantaneous life buoy for Taylor's business. He still had many painstaking years ahead, building a reputation job by job by job. "It took me two or three years to make as much working for myself as I'd made working for someone else," Taylor said. Among the lessons he learned along the way is a simple maxim oft-repeated in one form or another. "Don't get too big for your britches that you cannot treat everyone high and low equally and with the same respect," Taylor said. "I think in any kind of business, that is just a very large part of success." Another is simple perseverance. "It takes being patient," Taylor said. "You have to build a reputation, and as more and more people find out about you, then more and more of them want to use your business." And last, but not least, Taylor said, is not to wait too long to retire. "I have very mixed emotions about retiring," Taylor said. "I love my employees and I'm good friends with a lot of my clients and people in the community and all. I hate leaving that. But then on the other side of that, there are things I want to do, and you might make a mistake if you wait too long." Among those other things Taylor might do is taking his boats out to test whether he's really jinxed with them. "I had a reputation for a while of being jinxed with boats," Taylor said, recalling an occasion when his recently repaired boat sank in the Illinois River up by Grafton, and another occasion when half of an engine broke free while at the lake. "My friends have had good laughs over it for many years." Laughs surely will continue for Mr. Taylor over many years to come — hopefully without any boat jinx. ​Farmington completes radionuclide filtering system. All water systems now comply with stricter federal guidelines. 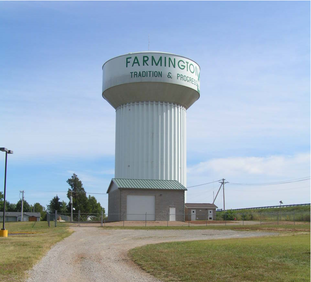 FARMINGTON — Years after being told it must rid the public drinking water system of nearly all radionuclide contamination, Farmington has completed the installation of a dozen costly — but mandatory — filtration systems. On Nov. 10 the city “initiated operation” on the last treatment plant to be installed at 12 of the municipality’s 13 water wells. One well has consistently come in under maximum allowable contamination, meaning it did not have to be treated. Putting that final plant online meant the city is now “fully compliant” with requirements set down by the federal EPA, according to a press release. ​“The city's water system is now fully compliant with the Administrative Order negotiated with the U.S. Environmental Protection Agency and the Missouri Department of Natural Resources in 2007 regarding the non-compliance of the ground water supply with the radionuclide limits. “The city's water supply currently consists of 13 deep aquifer wells. Unfortunately, these wells are drilled into granite formations that produce high levels of radionuclides. Twelve of Farmington's thirteen wells have levels above the MCL's established by USEPA, and adopted by MDNR.